With the Jets slipping out of contention for a playoff spot, they continue to fail to put together a winning streak: they haven’t won two straight since they beat the Islanders and Devils at the end of November. They had the opportunity to end that trend with a victory Sunday night against the Canucks, yet they fell to the West Coast team by a score of 2-1. Vancouver opened the scoring at 10:09 of the first period with just one second remaining in an Evander Kane holding penalty. With Kane standing up in the penalty box, defenceman Dan Hamhuis fired a shot that Richardson deflected. The puck bounced in front of Pavelec and into the net for Richardson’s seventh goal of the season. The Jets tied the game at 9:38 of the second period after Daniel Sedin was called for holding. Wheeler set up the goal, sending a pretty pass to Kane, who beat Lack on the glove side. 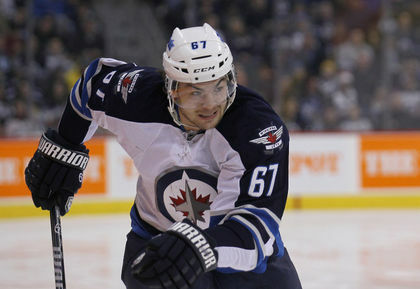 Jets rookie Mark Scheifele also earned an assist for his eighth point (three goals, five assists) in the last five games. The Jets continued their inconsistent ways with a 2-1 loss to the Canucks on Sunday. Defenseman Chris Tanev gave Vancouver the lead at 10:23 of final period. He took a pass in the high slot from Zack Kassian and ripped a shot past Pavelec. The Canucks never looked back, and Tanev’s goal was the gamewinner. If the Jets want to squeeze into a playoff spot, they’ll have to start putting together consecutive wins, and the search for a win streak begins again when they face the Oilers Monday night.